Up the narrow neon escalators passing through the core of the book spiral up to the eighth floor at the Seattle Central Library, toward an icy geometric exterior, a sign makes a nod to the Indigenous people who have lived in the Pacific Northwest long before White settlers came to this area. “The Seattle Public Library would like to acknowledge that we are on Indigenous land, the traditional territories of the Coast Salish people.” states a plaque on the wall. Past this sign is the first installation of an art show titled Yəhaw̓. Bright glass podiums host pieces that range from traditional cedar weaving, beading and woodwork to landscapes and Coast Salish style paintings exploring themes of environment and place. This gallery is just one tiny piece of a much larger project. 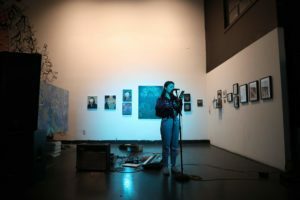 Curators Tracy Rector (Seminole/Choctaw), Asia Tail (Cherokee Nation), and Satpreet Kahlon have brought together more than 200 artists and 20 partner locations spanning Seattle, Bellevue and Tacoma to create a show celebrating Indigenous artists. Shows and events will run for a full year and include hundreds of hours of programming. 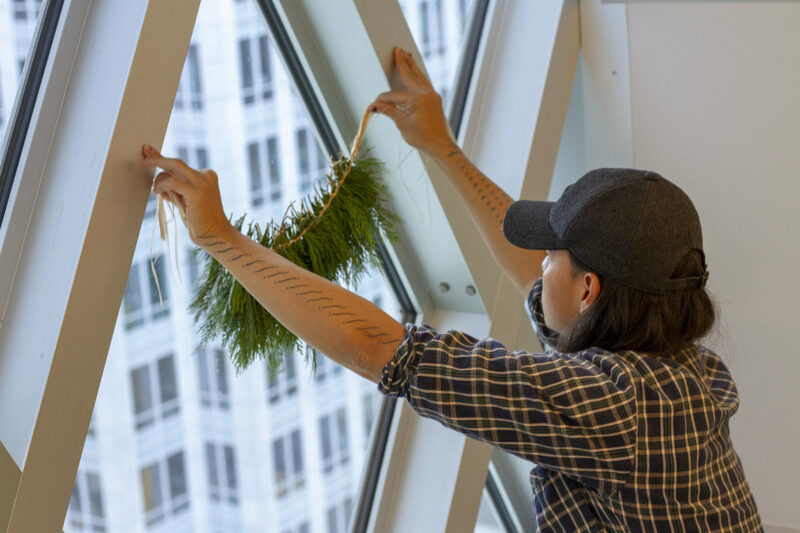 “Yəhaw̓ is extremely different from any other biennial, triennial, art show that I have ever encountered because of its capacity building, mentorship and support,” said S Surface, program lead at King Street Station in Seattle. The gallery and events at the library began in October and are the first iteration of the show. 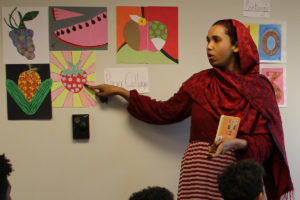 The project, with multiple gallery showings at the library and King Street Station, will run through fall of next year. The largest installation is coming up in Spring 2019 at King Street Station as its first community show in a newly renovated gallery space. The show at the Seattle Central Library developed from a collaboration between the location and artists. For the past few years the library has had an annual social justice topic, and this year’s focuses on environmental justice. Project lead Davida Ingram explained it was very important to the library to provide that space for Indigenous folks to run the show. The result is two open-faced rooms with different focuses. On the left, a gallery of art by Coast Salish women artists curated by Denise Emerson (Diné/Twana) will stay through the whole show. The right hand side will instead house a shifting exhibit added to and changed by artists in residence as they create art in real time each week. First was Native Kut, which includes artists Pah-tu Pitt and Sean Gallagher. 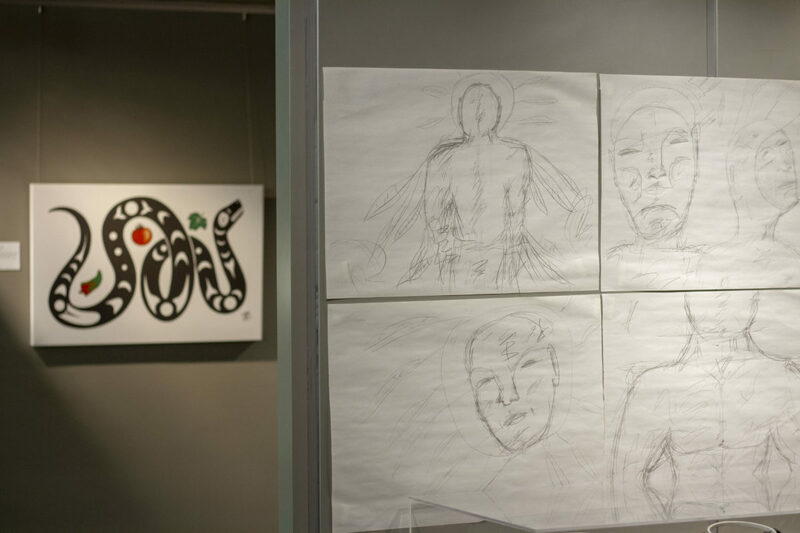 They focused on printmaking and wood carving demos inspired by Indigenous water rights. Roldy Aguero Ablao used both materials from Guam and local cedar branches and bark to create woven pieces that bring together various identities. 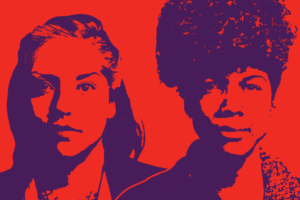 Fox Spears has one more day of residency left on Nov. 24. He is a print maker and focuses on patterns inspired by the Klamath River, where his Karuk ancestors lived since time immemorial, as well as the river systems in Washington and the Pacific Northwest. The scale the project stands out, with 200 artists; even the largest international shows tend to have a maximum of around 150 artists and last for just a few months, according to this survey from 2013. The scale of the project is impressive, but even more is the intention behind it. This looks like an open call, where every artist who applied is featured, and a structure where each step of creating the show is a chance for all involved to gain new skills and opportunities. Curators chose the name “Yəhaw̓” itself from a Coast Salish story from this area. It means “to go forward, to do it.” In the story, the word was a tool for different tribes who didn’t speak the same language to be able to work together. The curators posted a video of the story on a website for the show. This project seeks to be a “collective portrait of Native America, including creatives of all ages and stages in their careers, from Urban and Reservation communities, working in contemporary and traditional materials, and in ways that may or may not be widely recognized as Native,” according to their website. Indigenous identity can be complex, and this show creates space for a wide range of experience. One featured artist, Roldy Aguero Ablao, expressed his gratitude for that opportunity during his artist residency. He identifies most with his Indigenous Chamorro upbringing in Guam and is also Korean and Filipino. 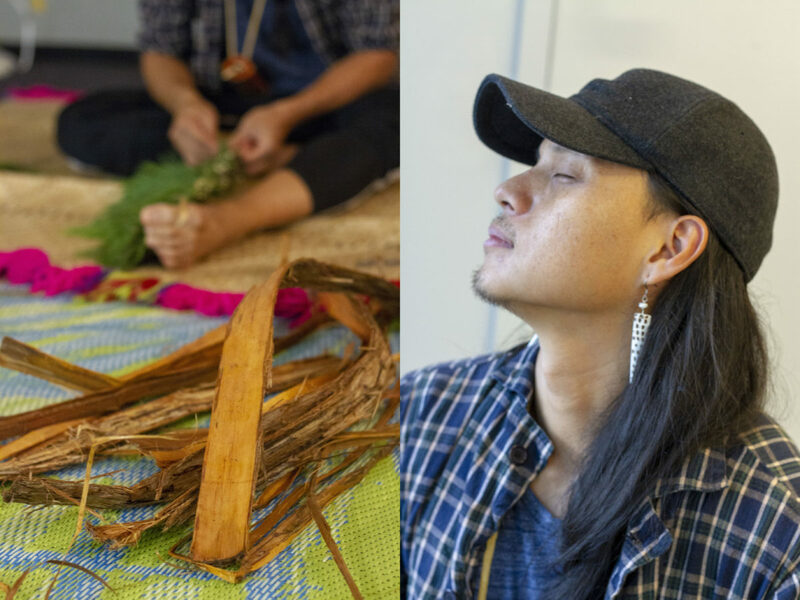 He has spent half his life in Seattle after moving here at age 18, and the process of connecting with his Indigenous identity is continual. Once when learning about his traditional forms of weaving while living in Seattle, he had to import coconut palm leaves from Florida. He laughed while he explained that the leaves dry out so fast that he kept them in the bathtub and showered around them for days to keep them fresh. Here in the Coast Salish region, Seattle is named after Duwamish and Suquamish Chief Si’Ahl, but much of the rest of Indigenous history is not readily visible. Evidence has been found of Indigenous communities living here for the last 10,000 years, and this knowledge, craftsmanship and cultural identity has stayed strong even through colonization and brutality. Having artists in residence means not only a chance to feature local artists, but also because it brings back the core message that “first and foremost we are still here as Indigenous people” as Rector said of the program. In the static side of the gallery a vibrant green map is illuminated on the back wall. 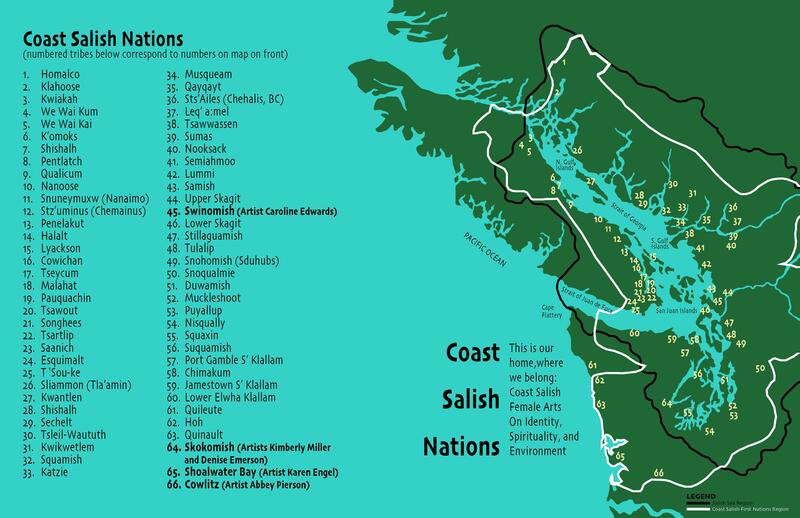 Look closer and you’ll see the outline of Coast Salish territory, including pinpoints of where each represented artist is from. Curator Denise Emerson created the map, which engaged her memories of growing up in this area. A larger version of this map , created by curator Denise Emerson, hangs in the gallery at the Seattle Central Library. 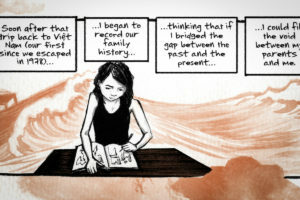 Emerson explained that being urban and Native living in the city can be difficult, but that her parents made sure she stayed connected, both to the landscape of this area and to her history. “My parents always told me that when you meet other Indigenous people, they will understand you like no one else understands you.” Emerson said. “They belong to you and you belong to them.” This has really been true for her in this curatorial process and in being part of Yəhaw̓. As part of the process of knowledge sharing and empowerment at the core of Yəhaw̓, this was her first curatorial experience. 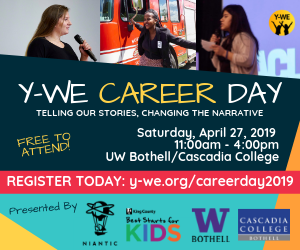 Included in the show are Caroline Edwards (Swinomish), Denise Emerson (Diné/Twana), Karen Engel (Shoalwater Bay), Kimberly Miller (Skokomish), Abigail Pierson (Cowlitz). Tags: Arts and Culture, native american, Native Americans, seattle public library. 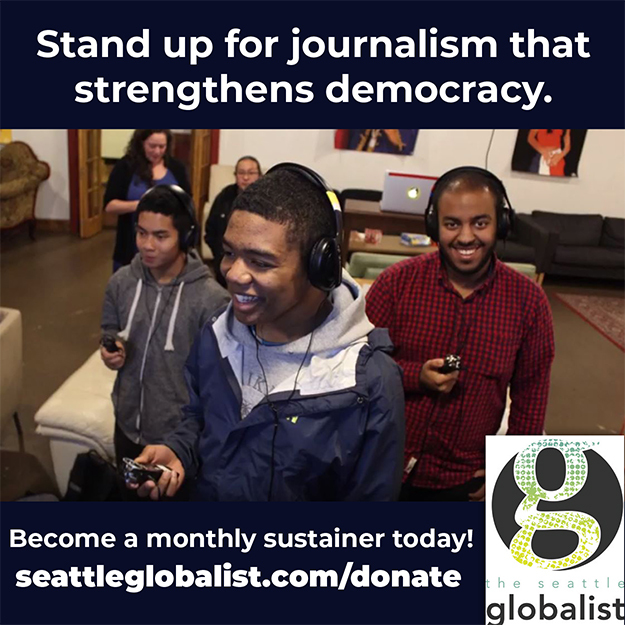 Keelin Everly-Lang is a student at the University of Washington and has a passion for reporting on environmental justice. She focuses on solutions based reporting on issues and innovations that impact marginalized communities. When she’s not studying or reporting, she can be found at local urban farms, eating, growing and talking about food, or at PCC Community Markets where she works, doing much of the same.